I've waxed poetic about my love for Urban Decay Primer Potion time and time again. (Like here, and here, and here, and, well, here.) It keeps eyeshadow in place all day long with no creasing, fading or smudging -- I just haven't found another product like it on the market. EVER. But the one thing Primer Potion hasn't had going for it all this time? The packaging. The strange, swoopy tube gets so much product caught in it that you literally have to cut it in half to reveal at least half of the primer. So color me happy today, because they're FINALLY launching a much easier to use squeeze tube! Thank goodness for Urban Decay Primer Potion Professional Size -- I can finally get each and every drop without cursing the primer gods. 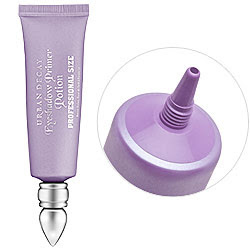 Urban Decay Primer Potion Professional Size retails for $29. I have used Clarins Product's on my face. But, never the lipstick. The colours are so beautiful! I would love to try ;thee Clarins Lipstick for Fall!